Glo Friends figures list & information page! 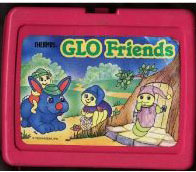 This page is designed to help Glo Friends collectors identify their Glo Friends collectibles, and to find out what Glo Friends exist. These toys are not for sale, this page is for information purposes only! with a warm and friendly light. 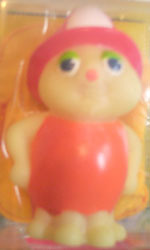 Pink body with big white wings, pink hat. 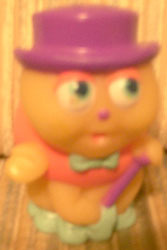 Orange body, purple hat, 6 arms, 4 white wings. Purple body, dark purple bow on head, white & pink wings with purple spots. Green around back of neck, Blue wings, orange hat, holding green book & Pencil. 8 legs, Dancing spider, orange shirt with blue bow & shoes, purple hat & cane. 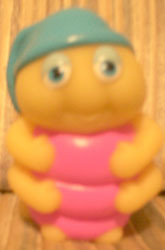 Pink & blue striped body, pink hat, blue wings. 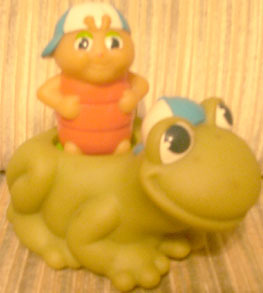 Green, wearing white & blue baseball hat, Rolls on floor, Glo Slugger rides on back. Pink wings with white & blue designs, green hat, holding star wand. Pink body, hands on hips, blue hat. 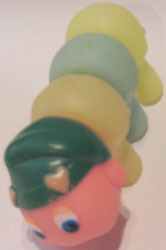 Green & Yellow body, red hat, white wings. 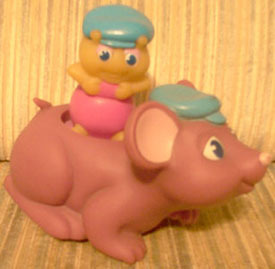 Glo Country Mouse Purple Mouse wearing blue hat. 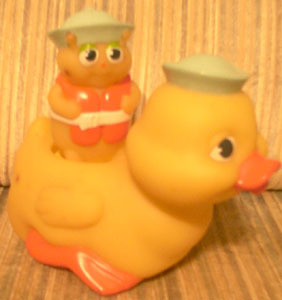 Glo Cappy rides on back. Holding accordion, blue shirt, red hat. 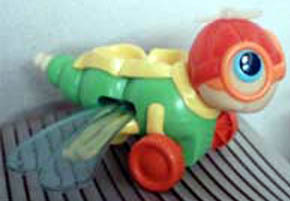 Glo Waterbug rides on back. Artist, Has splatter painted wings, wearing blue hat & bow tie, holding paintbrush & bucket. 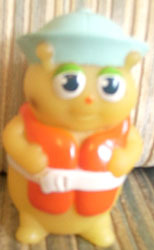 Green body, big blue wings, orange glasses, wearing beanie hat with copter on it, yellow back & red wheels. There were 15 Dragonflyer's assembled at the Hasbro Pawtucket, RI headquarters in 12/85. 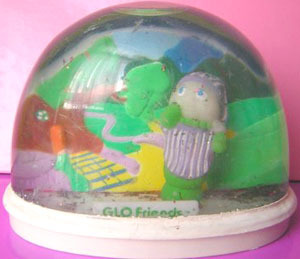 The Glo Friends line was canceled as a result of poor audience response to the Glo Friends Save Christmas special, and the Dragon flyer's were not put into production. The 15 prototype Dragonflyer's were distributed to the various members of the product team, at least 2 of the 15 were destroyed. 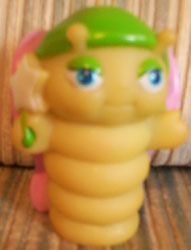 The wings move up and down when rolled along and it makes a boinging sound. The head can be turned. 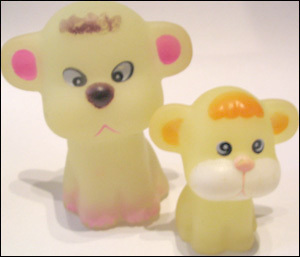 The head and tail glow in the dark. 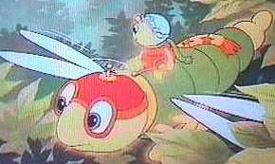 Glo Shuttle bug was to be sold along with the Dragonflyer. 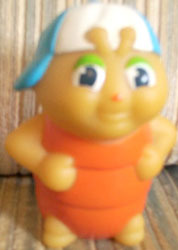 The Shuttle bug was an orient import and was ordered in quantity in advance of the product release so there were a lot of them available and they were sold separately. No packaging was ever made for Dragonflyer. Other Dragonflyer's used for product testing may exist but they are not the proper colors. "Friends in Dark places" website. 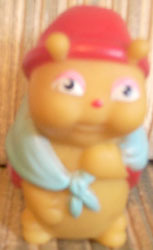 Red body, Has red and white fire hat, white wings. 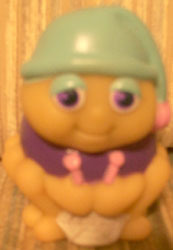 Butterfly, purple body, hat & wings. Pink spots on wings. 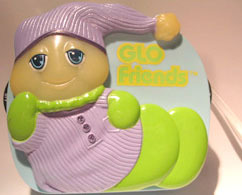 This Glo Friend was only available through a Mail order offer offered in Canada, the entry form came in packages of other Glo friends figures. Red w/ green farmer hat. Red hat, blue scarf, red & white lady bug spots on wings. Green body with yellow wings. Blue with white wings, white cowboy hat. 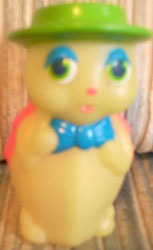 Green body, orange acorn hat. 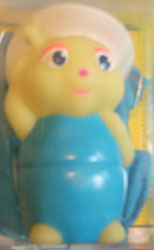 Blue body with big closed blue eyes, pink hat, white wings. 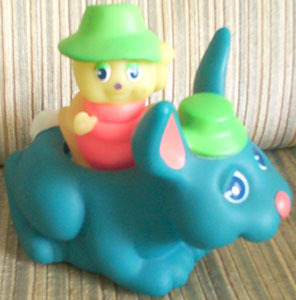 Glo Rabbit Blue rabbit, rolls on floor, green hat. Glo Garden Ant rides on back. 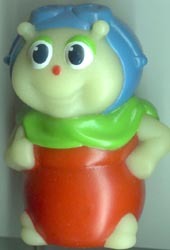 Red body, green scarf, blue goggles on head. 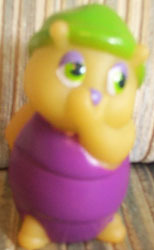 Purple body with green hat, holding nose. White & Blue baseball cap, Orange body. 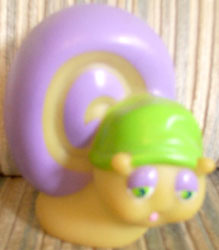 Glo-Snail Purple shell, green hat with pink tassel. Red scarf, Blue hat with white ball on end, green on back. Blue hat, Purple shirt, Knitting a spider web. 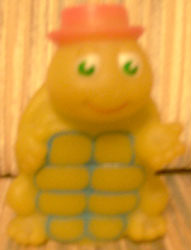 8 arms, pink body, blue hat. Blue bow, green hat, orange wings. Yellow and green shell, opens to store stuff, rolls on floor. 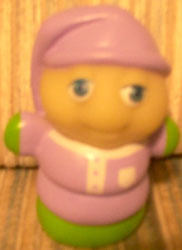 Green body wearing purple pajamas & hat. Glo in the dark Glo Cricket figure stamper, Stamps Glo Cricket face. 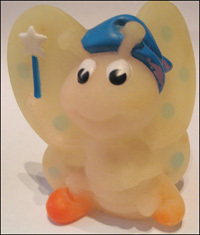 Glo in the dark Glo Worm figure stamper, Stamps Glo Worms face. 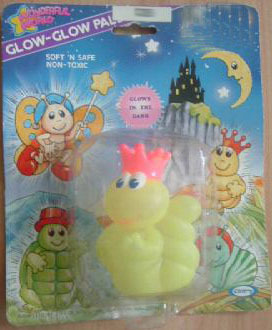 Glo in the dark Glo worm bubble blower. 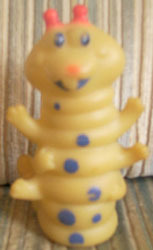 Orange nose & antennas, blue spots. Made by Avon. 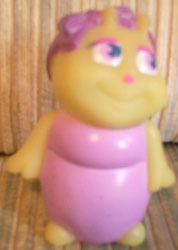 Comes with soap in the bottom of the worm to color in the tub with. Blue spots, Made by Avon. 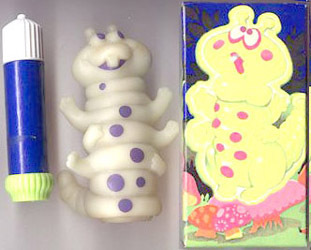 Comes with soap in the bottom of the worm to color in the tub with. 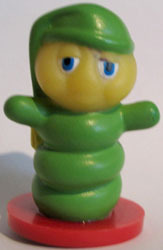 Green worm with book and glasses, does not glow, but I think he makes an appropriate friend! 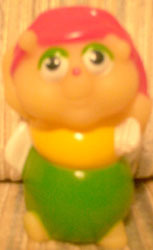 Gerber 1985. Yellow with black stars down chest, yellow hat & green book. 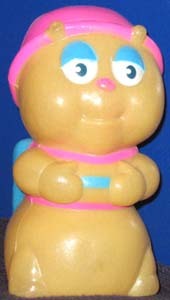 Gerber 1987. Does not glow, but I think he makes an appropriate friend! 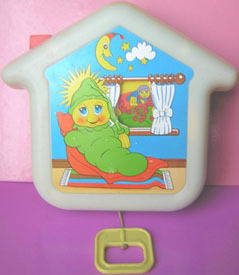 Gerber 1985. 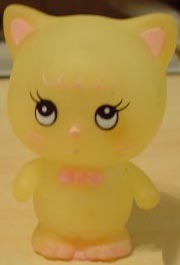 Glo in the dark cat, from unknown toy series but sure looks like a great friend for the Glo friends! Glo in the dark horse made by the company, Soma. 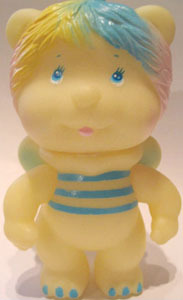 Glo in the dark Merman figure. 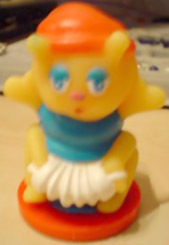 Made by Soma 1985. 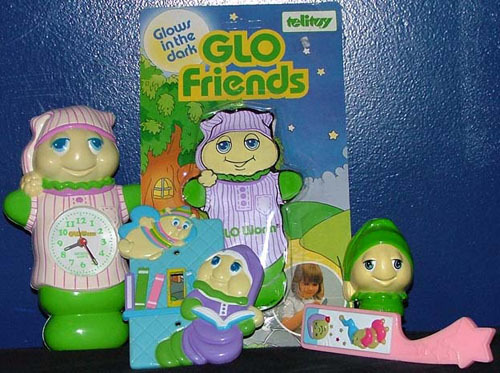 Glo in the dark baby, not sure what company it is made by. Has baby sucking on a pacifier. 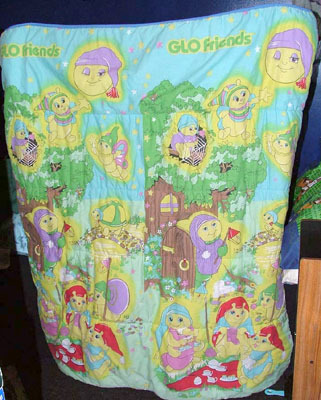 Glo in the dark Monkeys, not sure what company it is made by. 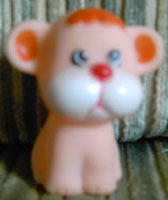 Glo in the dark Lion, Made by Soma 1985. 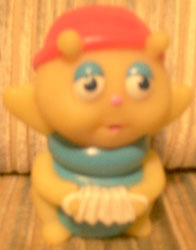 Glo in the dark bee. Made by Soma 1985. 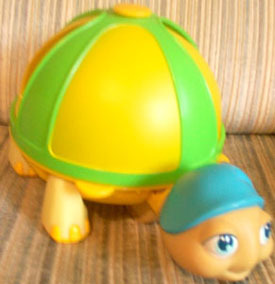 Glo in the dark turtle, Green body, blue shell cracks on front and back, red top hat. Glo in the dark worm with red crown on. 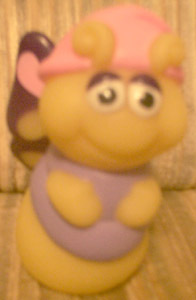 Glo in the dark snail. Glo in the dark Butterfly. 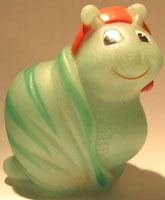 Glo in the dark colorful worm, not sure if this is a real item or a fake. 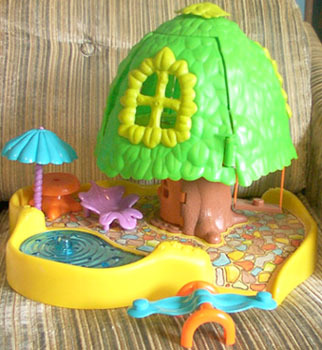 Glo Land -Glo Land is a big Tree house for your Glo Friends to live and play on, it comes with a light up pond, leaf chair, teeter-tooter set for 2 friends, swing that sings, moving elevator, bed, table & umbrella set and a Glo Bedbug figure. 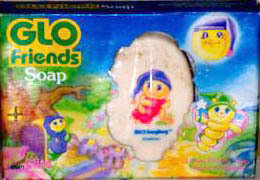 Glo Friends Collectors case - Holds 12 Glo Friends, snaps closed. 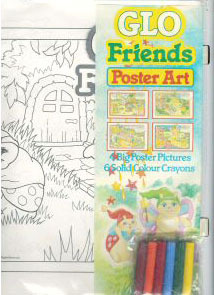 Glo-Friends Trace and rub coloring book - This book has trace sheets so you can trace your pictures and also color them. 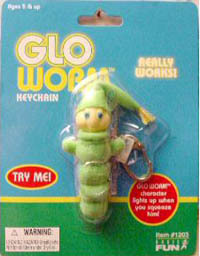 Glo worm clip on -You clip this Glo worm onto your pocket. 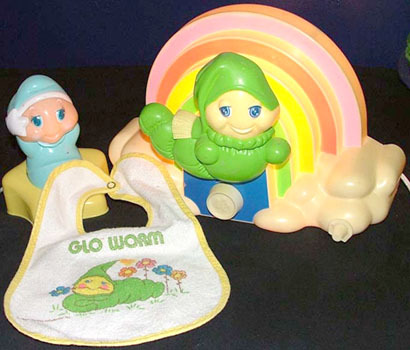 Glo worm light/lamp with Rainbow background. 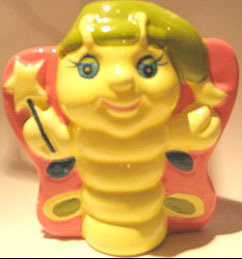 Baby Gloworm on star light/lamp. 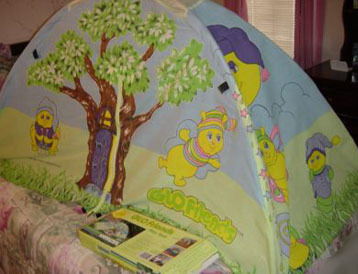 White with yellow trim baby Gloworm bib. 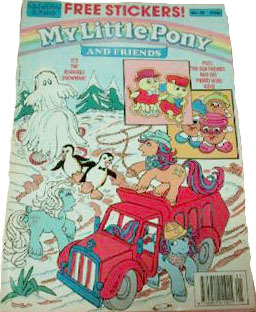 My Little Pony and Friends comic book with Glo Friends & Potato head kids. 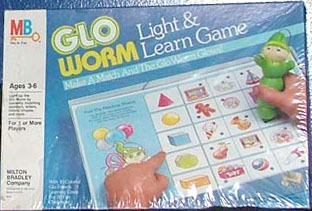 Glo Worm light & learn game. 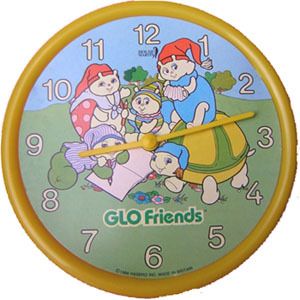 Learn to tell time Glo Friends clock. 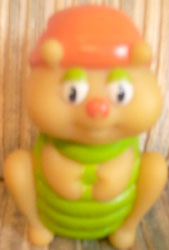 Glo worm wishing well toy. 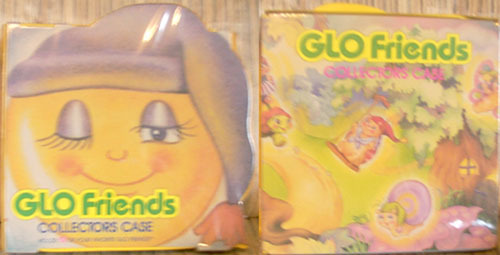 Glo Friends poster art package. 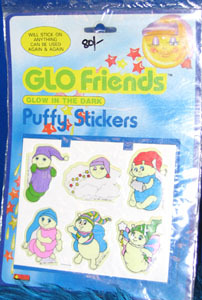 Glo Friends package of stickers. 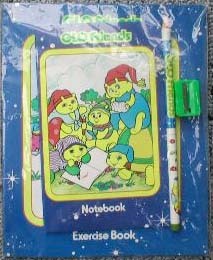 Glo Friends stationary set -includes notebook, Exercise book, pencil & Pencil sharpener. 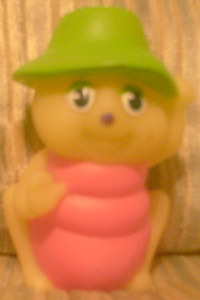 Glo worm Sip N Clip straw figure. 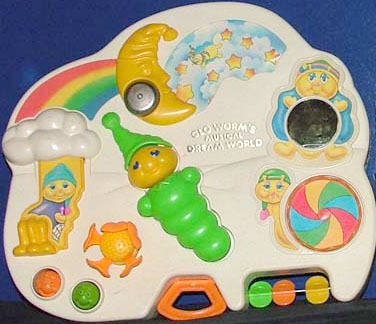 Glo Friends Musical Crib toy. 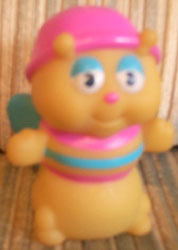 Glo butterfly holding star hand, yellow body, green hat. 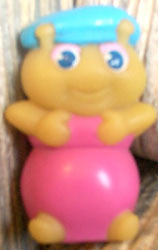 Glo bug -Pink & blue striped shirt, yellow body. (see her collection here.) for help with the site!